Twenty two Top 75 singles (and that's not counting chart entries in almost every record buying country in the world), three Number ls, five hit albums and one of Britain's most successful performers of all time - we're not just saying 'pop star' here, we're talking 'super-star' and shouting 'Lea-der Lea-der' to the ultimate, the one and only Mr.Gary Glitter. When the first Gary Glitter 45 "Rock'n'RoII (Parts 1 & 2)" reached the No.2 position in the summer of 1972 it was generally thought that this 'overnight sensation' was a new talent. However, Gary had in fact been performing and releasing records since 1960 under such names as Paul Raven, Paid Monday and Rubber Bucket (though not under his real name, Paul Gadd) and had spent the best part of the 60's on the booming German club circuit and had even worked as a 'warm up man' for TV's "Ready Steady Go!" pop programme! This period of 'paying your dues' would later stand Gary in good stead when success finally came his way and it was also during this time that he first worked with respected song-writer/producer Mike Leander, Mike started writing a couple of Gary's singles in the 60s and secured him the role of two priests on the sound-track to "Jesus Christ Superstar"
...With Gary scoring a No.1 with "Always Yours" (June '74) and a No.2 with "Oh Yes! 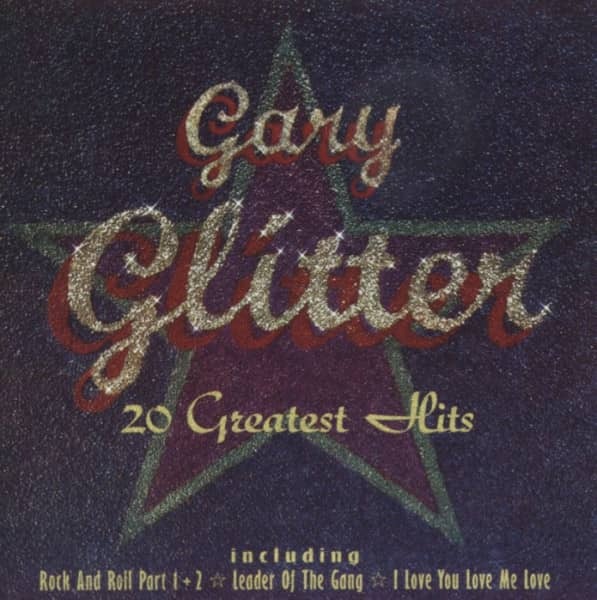 You're Beautiful" (Nov.'74), The Glitter Band went Top 10 at the same time with "Just For You" and "Let's Get Together Again" and the formula was repeated in 1975 with Gary charting with "Love Like You And Me" (No.10) and "Doing Alright With The Boys" (No.6) and The Glitter Band chalking up hits with "Goodbye My Love" (No.2), "The Tears I Cried" (No:8) and "Love In The Sun" (No.15). However, the pressure to sustain such success and the strain of four years of constant touring, recording and being in the public view eventually took its toll and in early 1976 Gary announced his retirement from live performance to have a well earned break. 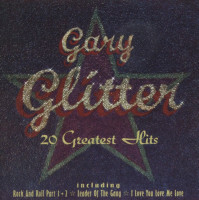 He still recorded, though, and scored minor hits with the likes of "Papa Oom Mow Mow", "It Takes All Night Long" and "A Little Boogie Woogie In The Back Of My Mind" though even Gary readily admits that they weren't in the true spirit of Glitter Beat. After a spell living in both France and New Zealand Gary returned to the UK in late 1980 with a short club tour and the release of the 45s "What Your Mama Don't See (Your Mama Don't Know)" and "When I'm On I'm On" and though neither were hits Gary still regards them as 'two of the best Glitter records I ever made'. The early 80s saw Gary adopted by a following of Punks and Mohawks who regarded him as the 'Godfather Of Punk' and as he once again started to fill the big venues people like Joan Jett and Generation X scored hits with recordings of his old songs, proof of Gary's influence on a whole new musical era. He returned to the charts himself with the summer of '84s "Dance Me Up" and Xmas of the same year once again saw Gary in the Top 10 with "Another Roclen'Roll Christmas". 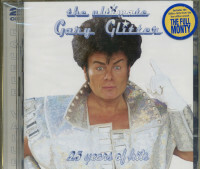 Since then his regular sold out Christmas jaunts round the UK's biggest venues, his guest appearance on The Timelords 1988 No.1 "Doctorin' The Tardis", regular album releases (one even produced by his son Paul) plus high profile TV adverts and guest slots on prime time television shows have ensured that Gary Glitter is never far from the public eye. miracle - but that's what Gary has done, still extravagant and still larger than life, just as he was when the first beat of "Rock'n'Roll" boomed out of the speakers all those years ago. As "Rock Hard Men (Need The Power)" - a track from Gary's forthcoming all new material studio album - more than amply shows, a quarter of a century of rockin' with the very best has riot dimmed the Glitter sound one hit and as Gary proudly points out about his latest recordings "I've got the beat, I've got the songs, I've got the power and above all I've still got the love of Roclen'Roll". Heroes may come and heroes may go but there'll only ever be one Leader and there'll only ever he one Gary Glitter.